Picture this: It’s the early seventies. You’re a black male. You sport a killer ‘fro. You’re living in the inner city, and the hot groups are people like Chicago and Earth, Wind, and Fire. You’ve grown up in a town soaked in Motown and Soul – Detroit. You’re a teenager, you need to rebel and your parents claim to be open minded. What do you do? You start a punk band. 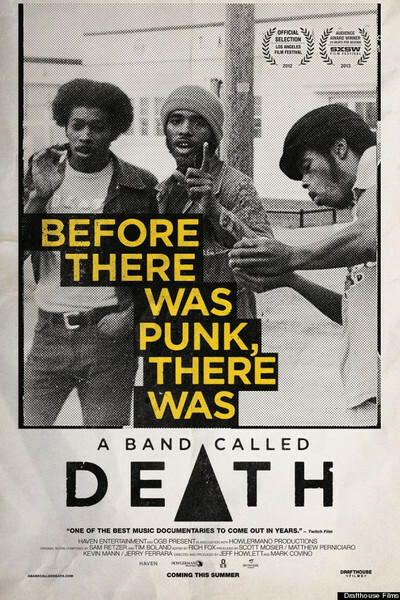 Part documentary a la Robert Burns and part current interviews and performances by Death and Rough Francis, the film recounts the genesis and trajectory of three brothers and a band. With influences including Alice Cooper, the MC5, Iggy Pop, the Who and Queen, these black kids were playing fast “white boy music” and in a “black boy” town, and met with little acceptance. A great story about integrity, regret, purpose, spirit and what music can mean. As teens, in the early seventies, the Hockney brothers formed a band in their extra bedroom. They got close to getting a record deal with Arista, and recorded a studio demo, but the eldest Hockney brother, David, stuck to his guns – the band’s name must stay Death. His brothers stuck to the family code – never fight and stick together – so Death never got a recording contract. As young men, Dannis (drums), Bobby (bass/vocals) and David (guitar/vocals) continued their musical odyssey. They found their way out of Detroit to the opposite end of the cultural spectrum, Vermont, and put together a Christian rock band. Eventually, David goes back to Detroit, but his brothers develop a reggae band which meets with moderate success. David cuts a single as Rough Francis, but only presses a few hundred records. His work, again, meets with rejection. Fast forward thirty years: enter the record collectors. Some of those interviewed include Henry Rollins, Joey Ramone’s brother Micky, and oddly, Frodo. Elijah Wood is a record exec, so, whatever, anyway, all these rabid fan-boy vinyl collectors are blown away by Death’s 45s. On eBay one sells for $800 bucks. Bobby Hackney ( bass) is flabbergasted when he finds this out from his son, and that his music is being played at underground parties in San Francisco. Finally, Bobby’s sons start a Death tribute band calling it Rough Francis to honor their uncle Dave, the visionary. David Hackney, the guitarist, song writer, oldest and the leader of the group, was a gifted, wild, wise, tortured soul with a drinking problem and a bad cigarette habit. He died of lung cancer, thirteen years ago. A huge loss to his family and especially his younger brothers. Prophetically, right before his death, he gave the demo tapes to his brother Bobby to keep safe, saying hang onto the tapes, people will come looking for this music. Boy, was he right. To find out where it’s playing and for more about Death see the links below.